Last week, nearly 165 students from 16 Chicago Public Schools (CPS) had the opportunity to showcase their engineering and science-based projects as a part of the Chicago Zoological Society’s annual science fair at Brookfield Zoo. In a series of conversations, students presented their projects to three judges from the Chicago Zoological Society staff, as well as executives from Chicago’s top corporations, including BP America, the event’s sponsor. Projects were judged on their connection to the inquiry learning process (science) or their ability to solve a real-world problem (engineering). Additionally, judges looked at how a project connects to the real-world in the big picture and a student’s overall understanding of how science and engineering are achieved. 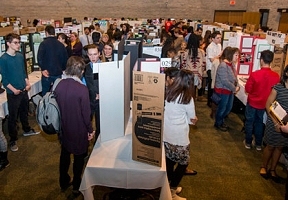 Schools that participated in the science fair include, Burnham Math & Science Academy, Burroughs Elementary School, Michael M. Byrne Elementary School, Chicago High School for Agricultural Science, Robert L. Grimes Elementary School, Nathan Hale Elementary School, Thomas A. Hendricks Community Academy, Jane A. Neil Elementary School, Jungman STEM Elementary School, Lane Tech College Prep High School, Marine Leadership Academy, Mount Vernon Elementary School, Richard Yates Elementary School, Von Steuben Metropolitan Science Center, Ida B. Wells Preparatory Elementary Academy, and William H. Ray Elementary School.